Even with promotional stunts like former NBA player Dennis Rodman and three Harlem Globetrotters‘ (Bull Bullard, Buckets Blakes and Moose Weekes) February 2013 trip to North Korea to run a children’s basketball camp, generally, the U.S. public at-large pays little attention to the enigmatic regime despite a history of saber rattling, eye-poking and nuclear missile testing aimed at the United States and its allies. Rodman declared upon his arrival to Pyongyang, “I come in peace. I love the people of North Korea!” In that moment, Supreme Leader of N.K Kim Jong-un basked in American love and attention via Rodman and an embarrassing press junket upon Rodman’s return to the states. The comedy of “basketball diplomacy” and serial threats of nuclear war aside, if not for Alan Alda’s 70s TV “war-comedy” MASH (Mobile Army Surgical Hospital), or the annual Memorial & Veterans’ Days airing of the ’59 movie “Pork Chop Hill” starring Gregory Peck and Woody Strode, depicting the Battle of Pork Chop Hill (not to be confused with Viêtnam War’s controversial Battle of Hamburger Hill) between the U.S. Army’s 7th Infantry Division, and Chinese and Korean Communist forces in April ’53 – baby boomers, x, y and millennial generations would know very little about the deadly conflict that has resulted in 60 years of constant belligerence on multiple fronts. That’s unless they had family or acquaintances who had fought, was killed or wounded in the war ~ perhaps on Heartbreak Ridge, Inchon or some other known or unknown battlefield. 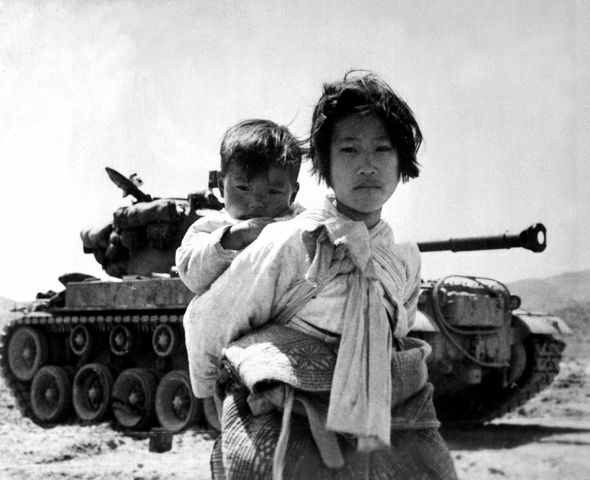 For boomers’ kids and grand kids, the Korean War is just an event in their history book. Chinese and North Korean death estimates vary widely depending on the source (or who’s doing the propagandizing). Western sources estimate that the Chinese People’s Volunteer Army (PVA) suffered between 100,000 to 1,500,000 deaths (others estimate a maximum 400,000 killed), while the North Korean People’s Army (KPA) reportedly suffered between 214,000 to 520,000 deaths (others estimate a maximum 500,000). Estimates of South Korean civilian deaths range between 245,000 to 415,000, and estimates of the entire civilian casualty count during the war range from 1,500,000 to 3,000,000 (most sources estimate a maximum 2,000,000 killed). Chinese sources claim that the PVA had only suffered 114,000 battle deaths, 34,000 non-battle deaths, 340,000 wounded, 7,600 missing and 21,400 captured during the war. They claim that among those captured, about 14,000 defected to Taiwan while the other 7,110 were repatriated to China. Chinese sources also reported that North Korea had suffered 290,000 casualties, 90,000 captured and “a ‘large’ number of civilian deaths.” In the “propaganda war,” the Chinese and North Koreans claimed that about 390,000 U.S. soldiers, 660,000 soldiers from South Korea and 29,000 other UN soldiers were killed. Obviously 390,000 (U.S. deaths as claimed by China) is a far cry from the 33,686 U.S. casualties reported by the U.S. Department of Defense. Prior to WWII, Korea was annexed to Japan with U.S. support. The U.S. backed Japanese colonialism going back to 1910. Japan subjugated Koreans similar to how blacks were treated in the U.S. In 1945, following WWII, the U.S.S.R. and U.S. divided control of the Korean peninsula. The Soviet Union accepted the surrender of Japanese units above the 38th parallel; the U.S. took the surrender of the Japanese south of that line. A demilitarized zone, or “DMZ,” separated north and south. The two emerging superpowers agreed to dual administration with the Soviets above the 38th parallel and the U.S. below it until an “independent” government could be established by Koreans. The split created problems from the start made worse by the ideological differences of the controlling countries. People both north and south were against the division of their country. Kim Il-Sung, a Korean exile who had lived in the Soviet Union and outside his native country for over 20 years, let it be known that his communist comrades had fought with the Chinese to help defeat the Japanese during the war and they would fight to unite Korea. Upon partition, the American Military Government (1945-1948) dissolved the peoples’ committees in the south, suppressed the Communist Party and other leftists. Unable to reach an unification agreement with the Soviets, the U.S. turned the problem over to the United Nations (U.N.) in September 1947. The U.N. established a commission to oversee a national election that would allow for an end to partition. But the Soviets rejected northern participation in the U.N. election. Even so, two elections took place. One election under the auspices of the U.N. in the south. The other under direction of the Soviets in the north was held in May 1948. A U.N.-sanctioned National Assembly of 198 members was elected in the process. One hundred seats were left vacant for North Korea to fill, but without response. Syngman Rhee was elected president of the Republic of Korea (ROK) by southern voters in ’48 election. The U.S., which supported the fascist Rhee puppet regime then created the south Korean army. The anti-communist Rhee, also a former exile who had lived and was educated in the U.S., also openly preached military unification of a “pro-U.S.” Korea. In the North, the Soviet controlled election choose Kim Il-Sung as premier. The North quickly became the closed society it is today. The Russians trained and equipped an army in the North, withdrew in ’48 and challenged the U.S. to do the same. Yet the U.S. did not completely withdraw keeping military advisers in the south for support. Then China turned communist in 1949. U.S. President Harry S. Truman believed that if one Southeast Asian country fell to communism others in the region would follow like dominoes and that U.S. trade, anchored by a conquered Japan, had to be protected at whatever cost. The Truman Doctrine preached ‘containment’ – or stopping the communists from gaining any more territory. In ’49, the U.S. supplied the South Korean army with 105,000 rifles, 2,000 machine guns, more than 50 million bullets, 5,000 military trucks, 79 warships and 20 fighter aircraft. The South Korean army was expanded to 150,000 troops by ’50 which reportedly outnumbered the North Korean Army, which had about 80,000 to 90,000 troops. Meanwhile, troops dug in on both sides of the 38th parallel and regularly traded shots across the border at one another. Thus, on June 25, 1950, the North Korean army, backed by the Soviet Union, crossed the 38th parallel in a full-scale invasion of their neighbor to the south, destroying or pushing back any resistance in its path. Truman responded by sending in U.S. troops to the peninsula where they were soon joined by soldiers from 15 other United Nations member countries. The Korean War was also important for the civil rights movement. It was the first war fought after Truman’s Executive Order 9981 issued on July 26, 1948. The presidential order bypassed Congress and banned racial discrimination in the armed forces and eventually led to the end of segregation in the services. Truman: “It is hereby declared to be the policy of the President that there shall be equality of treatment and opportunity for all persons in the armed services without regard to race, color, religion or national origin. This policy shall be put into effect as rapidly as possible, having due regard to the time required to effectuate any necessary changes without impairing efficiency or morale.” General MacArthur made no secret that he felt that blacks were inferior and allowed many senior commanders to simply ignore the command. Yet despite opposition, more than 90% of African-Americans soldiers served in integrated units by the end of the Korean War. Many of those returning soldiers became local, grassroots leaders advancing equal rights in their home communities. In the first month of the war, the North Koreans pushed South Korean and U.S. forces into a very small area on the Pusan peninsula of southeast Korea. In order to break out, General MacArthur hatched a plan to encircle the North Koreans by making an amphibious invasion to their rear. Inchon harbor was chosen as the landing site, partly because of its proximity to the capital at Seoul, South Korea. The harbor city fell on September 15, 1950, and weeks later Allied forces pushed the North Koreans back across the 38th parallel. Following Inchon, Allied forces chased the North Korean army to within a few miles of the Yalu River, on the border with mainland China. Then the Chinese entered the fray. Máo Zédōng, fearing an invasion of Manchuria would follow, joined the war on North Korea’s side. Men and materiel began pouring across the Yalu River. The reinforcements allowed North Korean forces to surprise the Allied army, which had overextended its resources in moving north in the same way that the North Koreans had done moving south. The use of nuclear weapons was given serious consideration a number of times during the war, according to Summers, especially as a means to stop the advancing Chinese after their entry into the conflict. The Eisenhower Administration came to power in January ’53 openly talking of using nuclear weapons, not just on North Korea but China and Viêtnam as well. Thus, after three years, the fighting ended with the signing of an armistice on July 27, 1953. There was no winner as ‘peace’ was never declared by either side. The country remained divided as the south never rose up as Kim had promised the Soviets. Even so, the Korean conflict was soon pushed off the front pages by events in another place in the region called Viêtnam. Amy Tan | Where does creativity hide? Judge Lawrence Knipel refused a request from parents to lift the vaccination order that was imposed last week to stem a measles outbreak. The parents claimed the city had overstepped its authority. The panel also upheld two other state laws protecting immigrants in the workplace and in detention facilities. The judges say the state has the right "to refrain from assisting with federal efforts." "Never before have US journalists been subjected to so many death threats," Reporters Without Borders said in its annual World Press Freedom Index, adding that President Trump "exacerbates" problem. The special counsel, Robert S. Mueller III, produced a report of more than 400 pages that painted a deeply unflattering picture of President Trump but stopped short of accusing him of criminal wrongdoing. The special counsel’s rationale for demurring on the question of obstruction of justice stood in stark contrast to that of the attorney general, William P. Barr. The redacted Mueller report has some new details about what happened during the Trump Tower meeting in 2016. The Mueller report concludes that the Trump campaign didn't criminally conspire with Russia during the 2016 election, but there were plenty of contacts between people in Trump's orbit and Russians. The long-awaited report clears President Trump of collusion but his opponents keep the heat up. Don't have time to read 448 pages? We challenged the BBC's Jane O'Brien to summarise it for you. The boy had been sleeping inside a campervan when a dingo came and dragged him away.